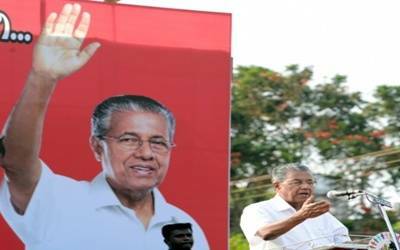 New Delhi, Sep 25 (IANS) Kerala Chief Minister Pinarayi Vijayan on Tuesday night expressed happiness after meeting Prime Minister Narendra Modi, saying he had "very fruitful" discussions on how to rebuild the flood-battered state. Vijayan called on Modi seeking the full support of the Centre in rebuilding the state in the aftermath of the worst ever floods in a century that ravaged the state. "Eighty per cent of Kerala’s population has been directly or indirectly affected by the tragedy. The state alone cannot handle the crisis. Hence the complete support of the Centre is required and this has been brought to the attention of the Prime Minister," he said. "The meeting was very fruitful and we have a lot of expectations," he told the media. Among the demands he has raised with Modi is a 10 per cent increase in all central schemes, a sum of Rs 4,796 crore from the National Disaster Fund and Rs 5,000 crore of special grant. The May-August disaster claimed 483 lives and at the height of the deluge there were 14.50 lakh people in over 3,000 relief camps. "We have sought the help of the Centre to get assistance from the World Bank and the Asian Development Bank. The PM has expressed all support in the demands that we raised." He said there were issues in accepting help from foreign countries. "But there is no bar in accepting help from the diaspora." Vijayan returned from the US on Sunday after being treated for an undisclosed ailment.